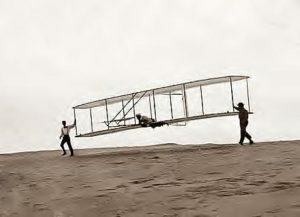 Langley insisted his contraption was “capable of flight.” Not that it could fly. It couldn’t. Langley wasn’t just anybody. 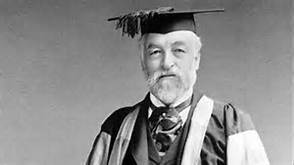 He was Samuel Pierpont Langley, blue blood, Harvard graduate, astronomer. Determined to be first with a manned flying machine, Langley built two ¼-scale models that seemed to succeed. But were they flying? Or were they being catapulted? With a $20,000 grant from of the Smithsonian Institute (Langley was secretary) and $50,000 from the U.S. government, Langley built the real plane, named the Aerodrome. It had to be launched with a catapult, just like the models. It also had to land in water, because it had no landing gear and also lacked the means of a controlled descent. Langley chose the Potomac River and invited everyone he could think of to view the Oct. 8, 1903 test flight. Even with the help of the catapult off the launch boat, the plane fell into the river like “a ton of mortar.” The pilot was rescued. The plane sunk. The second test date, Dec. 8th, was a repeat show. Again, the pilot survived. Nine days later, two brothers, bicycle repair shop owners with no college and little education, did it – their tiny, piloted plane flew successfully at Kitty Hawk, North Carolina. Langley wasn’t having any of it. 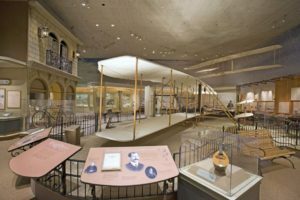 He proudly displayed a full-scale Aerodrome in the Smithsonian, calling it the first plane “in the history of the world capable of sustained free flight.” One writer said, “It was a lie pure and simple.” But one the Smithsonian got away with for four decades. Wilbur died in 1912. Orville carried on. Disgusted with the Smithsonian, he sent the Kitty Hawk plane to the London Museum in 1928. It was not until 1942 that the Smithsonian admitted the truth about the Aerodrome. 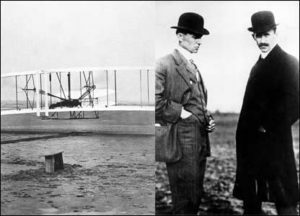 Orville then had the Wright Flyer shipped home from London. It eventually went on display at the Smithsonian, but Orville did not live to see it. He died of a heart attack while the Kitty Hawk plane was still in its shipping crate. A lie finally corrected. Wright Brothers plane on display at Smithsonian’s National Air and Space Museum. 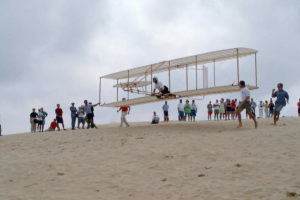 A replica of the Wright Brother’s unpowered glider soars again! Great story! Lies can be corrected! I hope that happens to some of the lies our current president is propagating — and better in 14 DAYS than in 14 YEARS as in the case of the “flying” aerodrome.